In the past five weeks, Adrian Peterson has rushed for 634 yards on 87 carries good for 7.3 yards per carry. This past weekend, the Seahawks’ defense completely dismantled the 8-3 Vikings in all aspects of their game plan. Peterson, on the ground, only managed 18 yards on eight carries good for a measly 2.3 yards per carry. How did the Seahawks stop the Vikings’ run game so successfully? Let’s use the film to find out. 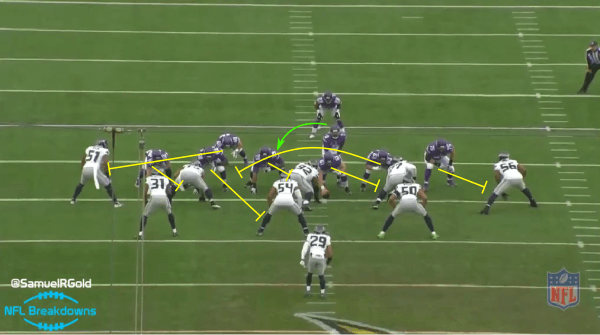 The Vikings line up in offset-I formation versus the Seahawks’ 4-3 Under defense. Peterson is in the backfield and the Vikings run two-back power to the right. The Seahawks bring eight men into the box to counter the run-heavy formation of the Vikings. After the snap, left guard #63 Fusco pulls to the right to lead block, while the tight end and the right tackle combo block defensive end #72 Bennett. Rookie RT #68 Clemmings gets pushed to the ground on the impact of the combination block, while LB #50 Wright hops over him to fill the hole. DT #77 Rubin brings Peterson down to the ground for a short gain on the play. A power running play is based on creating a specific running lane to run the ball downhill. Here the play fails because the combination block, the right guard, and the left guard pulling do not create a seam through the strongside B-gap for Peterson to run through. 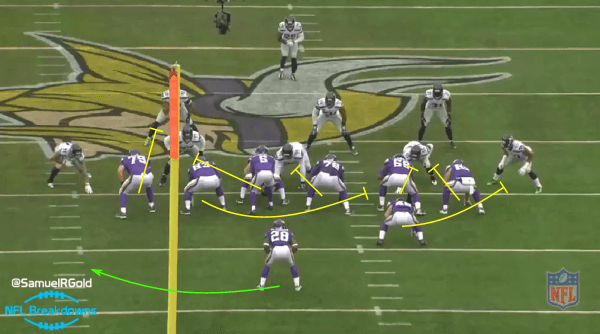 In the second half, the Vikings decide to fake the same power run as Play 1 (above) and run the outside toss to Peterson. The hope of this play is to get the cutback defender (#91 Cassius Marsh) to commmit inside opening the exterior running lane. Marsh does not fall for the bait and pulls Peterson down for a loss on the play. The Seahawks again bring eight men into the box to stuff the run. In the 3rd quarter, the Vikings attempt to run an off-tackle run to the left. The Vikings send their right tackle into the second level, while the tight end is pulled across the formation to trap block any backside defender. The Vikings combination block #92 Mebane using the center and the right guard, but Mebane holds his ground fighting the double-team. LG #63 Fusco gets no push on #77 Rubin, which does not open a hole for Peterson to run through. Peterson predictably gets tackled at the line of scrimmage for a minimal gain again. RT #68 Clemmings whiffs on his second level block, which is something that was written about in his scouting report. Watching LT #75 Matt Kalil, he fails to hold the edge on this running play as well, which allows his defender, #91 Marsh, to tackle Peterson from behind. 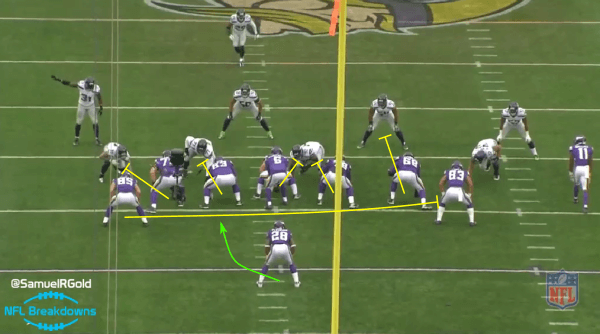 In this play, the Vikings use 13-personnel (three tight ends) on the line of scrimmage, while the Seahawks bring nine men into the box. Tight end #85 Ellison can’t hold his block while LB #54 Wagner clogs his running lane. The combination block on the nose tackle actually is successful opening the hole for Peterson, but the linebackers close the gaps limiting the gain to five yards. All eight of Peterson’s carries came on 1st down (6) or 2nd down (2). And on every single one of these runs, the Seahawks were so bent on stopping him, they brought eight, and even sometimes nine men into the box to do so. To bring eight or nine men into the box, the Seahawks love to walk strong safety #31 Kam Chancellor into the linebacker level. They have him fill one of the outside gap responsibilities in run support and a flat role in their Cover 3 packages, typically. Chancellor, standing at 6’3″ 230 lbs, is a nightmare for smaller wide receivers and a tough match for most tight ends as well. This is very similar to how the Redskins bring in their strong safety into the box against three-wide receiver formations in Joe Barry’s defense. If the Seahawks loaded the box, why not pass the ball? The Vikings tried on a few occasions on first down, but the Seahawks brought enough pressure with four defensive lineman to collapse the pocket. This forced Bridgewater into checkdowns. Even when Peterson was used on a screen pass it was sniffed out instantly by KJ Wright and Bobby Wagner so effectively Norv Turner abandoned calling them. The Seahawks actually ended the game with 4 sacks, 10 tackles for loss, and 7 quarterback hits. Was it just Peterson? How about McKinnon or Asiata when they were in the game? On the few runs that each had during this game, the Seahawks backed off the number of men in the box and favored their more traditional defensive approach of using Cover 1 and Cover 3. Clearly, they loaded the box for Peterson and it paid off as the Seahawks controlled the line of scrimmage on both sides of the field displaying a superior front seven against the Vikings’ offensive lineman and tight ends. Now Peterson only had 8 carries in this game. That’s because the Seahawks were up 21-0 by halftime and didn’t lift their foot off the gas forcing Norv Turner into abandoning the run. This caused the Vikings to be one dimensional and for a team that heavily relies on the run game to put together drives, like the Vikings, they just couldn’t manage. The Seahawks have won three in a row convincingly and are sitting at 7-5. 7-5 puts the Seahawks three games behind the Arizona Cardinals in the NFC West division race and only one game ahead of the Buccaneers and Falcons in the NFC wild card race.